Yes, it’s hard to believe, but there are still people out there who insist on using faxes, despite the fact that it would be much easier and quicker to send the information through email or some other means over the internet. Fortunately, if someone insisted on sending you a fax, or insists that you send them a fax, these days it can be done without having a fax machine. Once again, the internet comes to the rescue. First, if you need to send a fax, there are two websites I recommend which allow you to send a fax for free: MyFax.com and GotFreeFax.com. 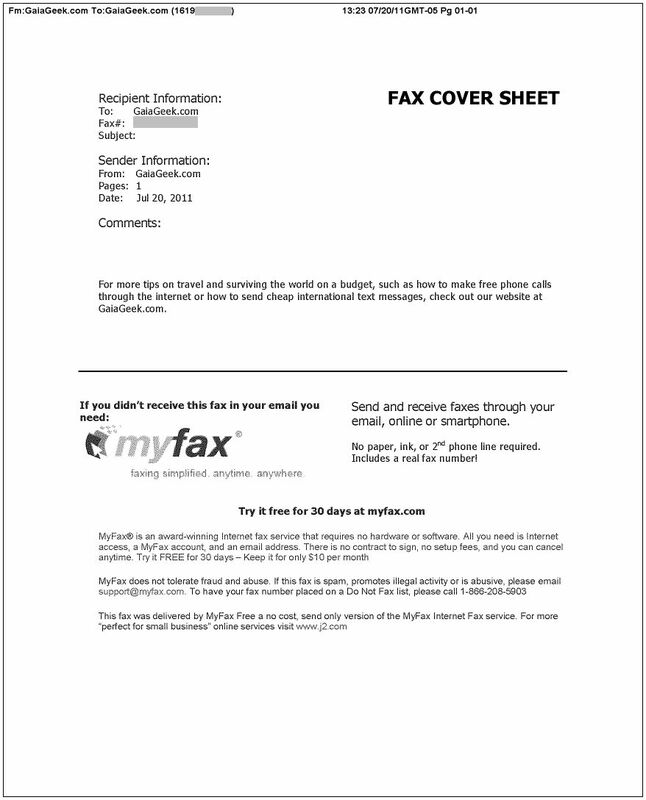 GotFreeFax.com doesn’t make the fax cover sheet into an advertisement for their service (see sample cover sheet below), making it my service of choice. However, you are limited to three pages per fax, so if you need to send something longer, you may need to go with the second choice, MyFax.com, which will allow you to send a fax up to nine pages in length. Both services limit you to two faxes per day unless you pay for a premium account. 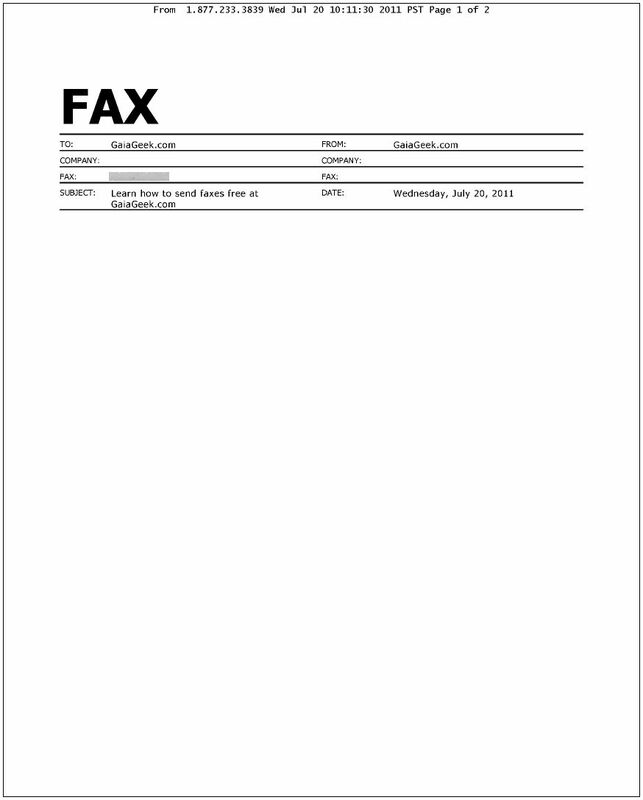 Below: GotFreeFax.com sample cover sheet. Click to enlarge. To send a fax, simply enter in the necessary information, choose the document to attach, and hit send. In order for the fax to actually send, you need to check your email and click on the confirmation link that’s sent to you. Look in your spam folder if you don’t see an email within a few minutes. After you click the confirmation link in the email, the fax will be on it’s way. Keep in mind that if you need to send a document containing sensitive information, such as something containing your social security number, you may want to send it using a real fax machine instead. On the receiving end of faxes, the best free service I’ve found is eFax.com. When you sign up for their service you get a free fax number which appears to be loosely based on the phone number you provide in your contact information, though probably not in your area code. For example, if you gave your contact phone number as 608-555-1234, you might get a fax number of 619-545-1234. If you want a number in your area code, you can get one with a paid, premium account, which also allows you to send faxes. After you sign up, you’ll receive a confirmation email with a link you need to click, and after this, another email which includes your new fax number and your PIN number. This second email ended up in my spam folder, so check there if you don’t find your PIN. Once you complete these steps, your fax number should be up and running, and you can test it out using one of the free faxing services above. You should receive an email when you’ve received a new fax which will also tell you to download eFax Messenger. If you don’t want to install the software, you can ignore this and instead log in to your eFax.com account and then click the link for the eFax Message Center. Once there, you should see the new fax, and when you open it, you’ll again see a message telling you to download the eFax Messenger software. Ignore this and instead, click on the filename at the bottom of the message and you should see the fax. Faxes only stay in your inbox for 30 days, so if you’d like to save it you can right-click it (or hold down Apple and click on a Mac) and save the graphic file. Not only can you get an incoming fax number in the US with eFax.com, but you can also get a number in Austria, France, Germany, Ireland, Italy, the Netherlands and the UK, making this a great option if you’d like to have an incoming fax number overseas. Note that eFax has apparently taken on the policy that by being a user of their free service, you must agree to receive advertising and special offers by email (translation: you can use the service for free as long as you allow them to send you spam). Given this, I suggest signing up with an alternate email address so that you’re not bombarded with daily spam at your regular email address just for a service you use a few times a year. If you use the service often and need the fax notices to come to your regular email, you can avoid the spam emails by becoming a paid user of the service. Of course, if you find this prospect of sending and receiving a fax online just all too complicated, you could consider an all-in-one printer which allows to make copies and scan documents or photos in addition to sending faxes. If you prefer something more simple and straightforward that doesn’t take up so much space, you might consider an ultra-compact fax machine which performs all the usual fax functions but which takes up very little space in your home or office.